Rangers G97 White - 2015 SCNPL Champions! With just one loss in CSL play this year (18-1-4), the G97 White team avenged that loss by beating NHB Black in penalty kicks in one of the semi-final SCNPL matches. Sunday’s final, had our Rangers girls playing longtime rival Man United. Having gone down 1 early in the match, the girls battled hard to even the score. Forward, Amber Marinero, scored the equalizer with just 3 minutes left in regulation time. At the end of the two 5 minute overtimes, the match remained tied. Rangers keeper, Aimee Hidalgo, set the tempo of the PK’s by blocking the first shot from Man United. Steadfast and true our girls made their PK’s while Man U succumbed to the pressure and missed 2 more shots. 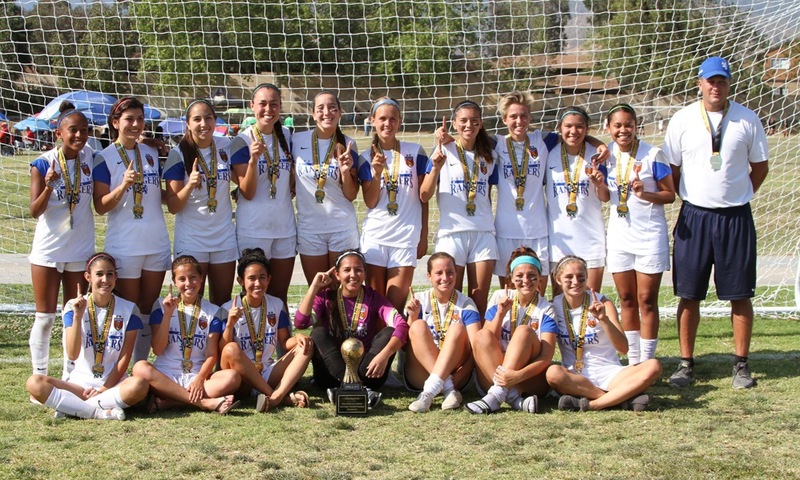 Congratulations girls – 2015 SCNPL Champions! We’re off to Indiana!